My Good Friend Mr Llandudno Sent Me This…..
A retired man, a local shop keeper, hotelier, and a bum who spends most of his time walking the streets, visiting watering holes and catching fish. We are, the one and only, Mr Llandudno. 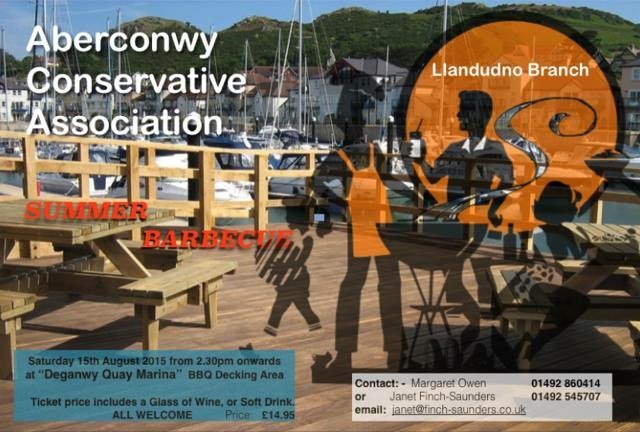 Some interesting news coming into Mr Llan HQ today, it would seem that our beloved Assembly Member for Aberconwy, Janet Finch Saunders attended the local Conservative’s BBQ at the Deganwy Quay Marina yesterday. Interestingly, was that Janet had some special guests at the BBQ, none other than MP for Clwyd West David Jones & his business partner Dylan Moore, now we know that Dylan Moore loves a bit of sausage, but what was Janet thinking? Why is Janet Finch Saunders acting so provocatively? Was she hoping to get a reaction from Bebb supporters by turning up with 2 of the main men behind Thoughts of Oscar? Why didn’t she go the whole hog and bring Nigel along too? Then the dastardly trio could have had a reunion, relive the glory years of Thoughts of Oscar & plot the downfall of Bebb!! Or perhaps Dylan Moore wanted some advise on how to be selected as a UKIP candidate for Aberconwy 2020? Was this Janet’s reward for stabbing Bebb in the back last year, that David Jones would hold her hand, provide some moral support for her at local party functions? ← Previous Previous post: The Not So Honourable MP For Clwyd West David Jones…..
Next → Next post: An Email From The Past…..